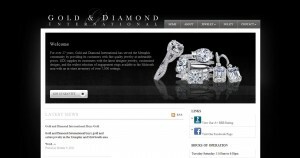 Gold & Diamond International address, phone, website, hours of operation, and more. For over 27 years, Gold & Diamond International has served the Memphis community by providing its customers with fine quality jewelry at unbeatable prices. GDI supplies its customers with the latest designer jewelry, customized designs, and the widest selection of engagement rings available in the Midsouth area with an in-store inventory of over 7,000 settings.